From afar, these stunning photographs may look like scenes from an alien planet or an avant-garde art piece, but they’re actually landscapes on our Mother Earth. 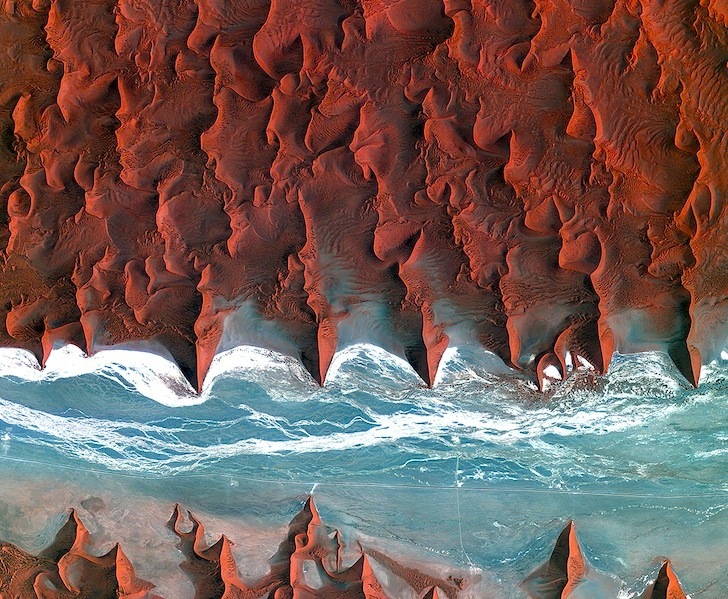 Curated by the European Space Agency as part of their Observing the Earth archive, these jaw-dropping images of Earth taken from outer space are a humbling reminder of how beautiful our world is and the importance of keeping our environment intact. Updated weekly, ESA’s Observing the Earth archive consists of thousands of photographs that date back to 2005. These Earth Observation images capture wide-angle snapshots of various landscapes with a precision that could only be matched by an “army of ground-level observers.” With incredible accuracy, these satellite images can capture environmental changes to the landscape in real-time, from a creeping blanket of air pollution to the catastrophic damage wrought by an earthquake. This long-term monitoring provides an objective assessment of human activity’s global impact and even the effects of climate change. Although satellite acquisitions are often depicted as static images, they are actually comprised of layers of workable digital data. Over time, the images collected can reveal the unfolding scale of environmental destruction and weather mapping and help contribute to environmental activism and identification of at-risk areas to natural disasters. 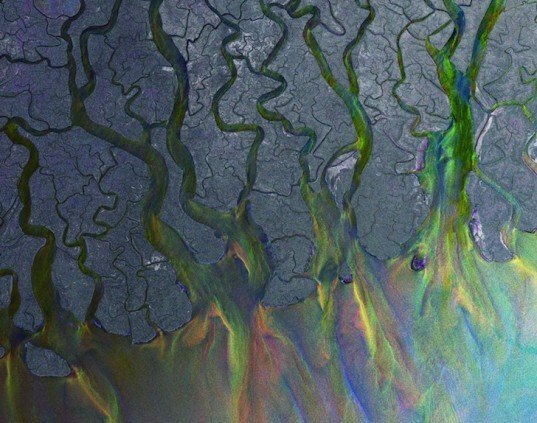 I just realised The Ganges Delta photograph is also the cover for Alt-j's album 'An Awesome Wave'.. The meticulously planned cultivated landscape of the communities of Aragon (west) and Catalonia in north-eastern Spain. Clearwater Lakes in Canada’s Quebec province. Thick blankets of clouds and snow over the Scandinavian peninsula. A picture of the Al Jawf oasis taken deep in the Sahara desert of southeast Libya. The foothills of the Andes mountains near the southern coast of Peru. The Mississippi River Delta, where the largest river in the United States empties into the Gulf of Mexico.